FertilityIQ: When Is The ERA Test Appropriate? My mission as a fertility specialist is to help patients achieve their dream of building a family. In vitro fertilization (IVF) is often utilized to attain that goal. In the best prognosis patients, it is expected that over 40% will have a baby after their first IVF cycle and about 70% will be successful after three cycles (1). However, this means that some women will fail to get pregnant after treatment. In those who do not conceive after several transfers of good quality embryos, a search for reasons for failure is typically undertaken. Many physicians have incorporated the endometrial receptivity array (ERA) into their workup for IVF failure, as this test was developed to evaluate issues with the receptivity of the uterus that may lead to failed implantation. Let’s have a look at why the ERA was developed, the evidence for using it and who benefits from its use. What is implantation and what causes it to fail? Women diagnosed with recurrent implantation failure will typically undergo an evaluation that includes an anatomic assessment, testing for blood clotting and genetic testing, as these factors have been associated with implantation failure (2). However, not all cases of failure are attributable to these causes. Given that a specific uterine environment is required for a pregnancy to succeed, the receptivity of the uterus may also need to be evaluated in cases of failed implantation (3). Is there a window of implantation? Traditionally it has been assumed that each woman has the same window, with implantation occurring 8 - 10 days after ovulation in most women (6). Consequently, embryo transfers have historically been performed on a specified day in all individuals to mimic what occurs in natural cycles. However, more recent evidence suggests that each woman may have a personal window of implantation due to alterations in the receptivity of the uterus (7). If a woman has a window that is displaced, the embryo and uterus may not be in synchrony and this may prevent implantation from occurring. How is uterine receptivity assessed? The endometrium is the inner layer of the uterus that allows an embryo to implant. Genes are responsible for preparing the endometrium to become receptive. An inquisitive group of researchers developed a test, the ERA, that evaluates over 200 genes that play a role in the endometrium becoming receptive (8). The ERA examines these genes, deduces whether the endometrium is receptive, and predicts a woman’s personal window of implantation. The goal with the ERA is to determine the ideal day for embryo transfer thereby decreasing the likelihood of implantation failure. The ERA is performed using a biopsy of the uterine lining and is done in the office without anesthesia. Progesterone is a hormone that helps the endometrium become receptive and during an IVF cycle an embryo transfer is normally performed after progesterone has been administered for five days. The ERA is done during a “mock cycle” on the same day that an embryo transfer would normally occur. Once the biopsy has been obtained, the genes involved in receptivity are analyzed and the ERA predicts the endometrium to be “receptive” or “non-receptive” on the day the transfer would have occurred. If the endometrium is deemed receptive, an embryo can be transferred using the same timing in a future cycle. If the ERA predicts that the endometrium is non-receptive, it is believed that a woman’s window of implantation is displaced, and the recommendation is to perform the embryo transfer after altering progesterone timing. Progesterone administration is shifted accordingly, and a repeat biopsy confirms that the new timing is correct. Once the correct window of implantation is identified, a "personalized embryo transfer" is performed in a subsequent month. Numerous studies have been published on modifiable components of an IVF cycle that may impact success, such as intracytoplasmic sperm injection, preimplantation genetic testing and protocol alterations. In contrast, there are limited data available on pregnancy outcomes in women who have undergone the ERA. Let’s review two published studies that have examined outcomes in 25 women with a history of implantation failure who underwent the ERA. Preliminary data are available on another large study that includes hundreds of women, but the final results have not yet been published, making it a challenge to reach definite conclusions at this time. 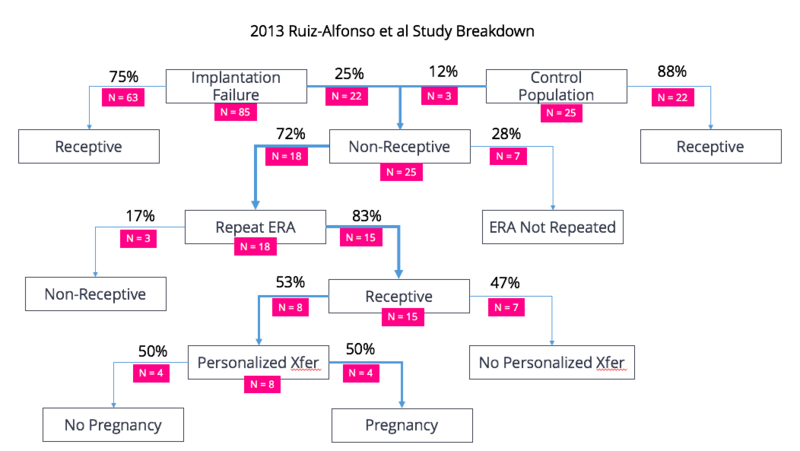 In a 2013 study, Ruiz-Alonso and colleagues performed the ERA on 85 women with recurrent implantation failure and compared them to 25 “control” individuals (women without a history of implantation failure) (3). 25% of the women with recurrent implantation failure were found to be non-receptive compared to only 12% of the women in the control group. Between the two groups, a total of 25 women were found to have a "non-receptive" endometrium. Of these, 18 had a repeat biopsy after adjusting the progesterone timing and 15 subsequently had were deemed to have a "receptive" endometrium. Pregnancy outcomes were reported in some of the women. In the eight individuals who were followed after a "personalized embryo transfer," the pregnancy rate was 50%. This can be confusing, so I outlined it below and created a data table to help. Another publication from 2014 by the same group of researchers reported results from a pilot study of 17 women who failed to conceive after at least one donor egg IVF cycle, underwent the ERA and were diagnosed with a non-receptive endometrium (9). These women were treated according to their ERA findings, subsequently found to have a receptive endometrium, and then underwent a personalized embryo transfer. Nine of these women had an ongoing pregnancy. Given the findings in women with a history of implantation failure, investigators then wondered whether all individuals should have endometrial receptivity assessed prior to undergoing an embryo transfer. A study examined this question by randomizing women in their first IVF cycle to a fresh embryo transfer, a delayed frozen embryo transfer or a personalized embryo transfer after ERA. Preliminary results demonstrated ongoing pregnancy rates of approximately 44% in the 134 women who had a fresh or deferred frozen embryo transfer compared to 55% in the 49 women who underwent the ERA followed by a personalized embryo transfer. Based on this preliminary data, the authors concluded that following the ERA there was a significant increase in overall pregnancy rates, but there was only a trend toward improvement in ongoing pregnancy rates. We are awaiting the final results of this study. What can be concluded from the data? The results from these studies demonstrate that the ERA holds promise. These data suggest that some women have a non-receptive endometrium, which may lead to an altered window of implantation, and that pregnancy rates improve if a personalized embryo transfer is performed in these individuals. The data also suggest that women with recurrent implantation failure have an increased likelihood of having a non-receptive endometrium, which may explain some cases of failure. Despite these findings, it is important to recognize the limitations of the studies when deciding whether to perform this test. One issue is that there are only a limited number of studies _published on the ERA and these _include small numbers of women. Although the pregnancy rate was 50% in the first published study, only 8 women were followed. The 2014 study also revealed a pregnancy rate that was impressive, however this only included data on 17 women. Hundreds of women were included in the most recent ERA study, but the final results have not been published, making it is difficult to make final conclusions. Another important fact to consider when interpreting the data is that every woman with a non-receptive endometrium who was followed had progesterone timing altered and underwent personalized embryo transfer. None of these women were compared to those who had a non-receptive endometrium but did not undergo personalized embryo transfer. To truly assess whether shifting the window of implantation definitively altered results, it would be ideal to compare outcomes in the women who were diagnosed as non-receptive and underwent embryo transfer at the standard time, as this would provide more evidence that the successful outcome was not simply due to chance or another unidentified factor. The design of the study makes it more challenging to conclude that a non-receptive endometrium translates into an absolute inability for implantation to occur. An additional issue to consider when interpreting the data is that embryonic abnormalities, which can contribute to failed implantation, were not controlled for in these studies. Moving forward it would be informative to examine only women who have failed to conceive after transfer of a chromosomally normal embryo to better ensure that if a non-receptive endometrium was diagnosed, implantation failure was more likely due to issues with receptivity, and less likely due to the quality of the embryo. There are a few downsides to the test that should be considered. First off, a uterine biopsy must be performed for the ERA and this procedure can be painful. Embryo transfer must always be delayed by at least one month and this can feel like eternity for many women. In addition, given that the ERA may not be covered by insurance, the cost (roughly $750 - $1,000) of the test can be prohibitive. So…who should be having this test? Given that the ERA seems like such a promising test, should it be performed on every woman undergoing an embryo transfer? Given the data and the downsides, universal application of the ERA seems premature. In the 2013 study, only 12% of the “control” women had a non-receptive endometrium. This means that many women would have to undergo an ERA unnecessarily if everyone was screened. If there were no downsides to the test and that data absolutely demonstrated the ERA was beneficial for all IVF patients, then this strategy would not be unreasonable. However, in addition to the factors highlighted above, it is important to realize that there is not absolute certainty that if a non-receptive endometrium is diagnosed, a woman will be unable to successfully conceive. Certainly, the improvement in pregnancy rates in the women undergoing personalized embryo transfer after a first IVF cycle is exciting. Once more data are available that definitively demonstrate whether the ERA does indeed improve outcomes for all, we may move towards universal application. But it just doesn’t seem that we are there yet. On the other hand, it does seem appropriate to offer this test to women with a history of implantation failure, as published data suggest an improvement in outcomes in this group. Unfortunately, there are no data on exactly how many embryo transfers a woman must fail before performing the ERA. However, offering this test to women with recurrent implantation failure, as defined previously, seems reasonable. But, it is important to recognize that the women in the 2013 study had an average of 5 failed cycles, and even in this group only 25% of had a non-receptive endometrium. This means that most women with a history of recurrent implantation failure will actually have a receptive endometrium. Nonetheless, after appropriately counseling women on expectations with this test, it seems warranted to consider performing the ERA in those with recurrent implantation failure. Unfortunately, there are no data available regarding whether the ERA should be offered when implantation fails after transfer of an embryo that underwent preimplantation genetic screening or were created using donor eggs. Future studies may help address whether and when the ERA should be performed when an embryo fails to implant in these scenarios. In conclusion, the ERA may improve pregnancy outcomes in women undergoing IVF. At this point, it seems that women who have been unsuccessful in conceiving after transfer of good quality embryos will benefit most from the ERA. However, if data confirm that the ERA improves outcomes for all women doing IVF, testing endometrial receptivity prior to embryo transfer may become standard. 1. Malizia BA, Hacker MR, Penzias AS. Cumulative live-birth rates after in vitro fertilization. N Engl J Med 2009;360:236-43. 3. Ruiz-Alonso M, Blesa D, Díaz-Gimeno P, Gomez E, Fernandez-Sanchez M, Carranza F, et al. The endometrial receptivity array for diagnosis and personalized embryo transfer as a treatment for patients with repeated implantation failure. Fertil Steril 2013;100:818–24. 4. Hertig AT, Rock J, Adams EC. A description of 34 human ova within the first 17 days of development. Devel Dynam 1956;98:435–93. 5. Navot D, Scott RT, Droesch K, Veeck LL, Liu H-C, Rosenwaks Z. The window of embryo transfer and the efficiency of human conception in vitro. Fertil Steril 1991;55:114–8. 6. Wilcox AJ, Baird DD, Weinberg CR. Time of implantation of the conceptus and loss of pregnancy. N Engl J Med 1999;340:1796–9. 8. Ruiz-Alonso M, Blesa D, Simon C. The genomics of the human endometrium. Biochim Biophys Acta 2012;1822:1931–42. 9. Ruiz-Alonso M, Galindo N, Pellicer A, Simon C. What a difference two days make: ‘‘personalized’’ embryo transfer (pET) paradigm: a case report and pilot study. Hum Reprod 2014;29:1244–7. 10. Simon C, Vladimirov IK, Castillon Cortes G, Ortega I, Cabanillas S, Vidal C, et al. Prospective, randomized study of the endometrial receptivity analysis (ERA) test in the infertility work-up to guide personalized embryo transfer versus fresh transfer or deferred embryo transfer. Fertil Steril 2016; 106 (supplement): e46-7. There are myriad reasons to take a "freeze-only" approach with your embryos. But the studies proving it drives better outcomes are few in number and small in size. This retrospective analysis on a large sample size of patients show "freeze-only" does not benefit patients equally.